Anaphase typically is a rapid process that lasts only a few minutes. When the chromosomes have completely migrated to the spindle poles, the kinetochore microtubules begin to disappear, although the polar microtubules continue to elongate. This is the junction between late anaphase and early telophase, the last stage in chromosome division. 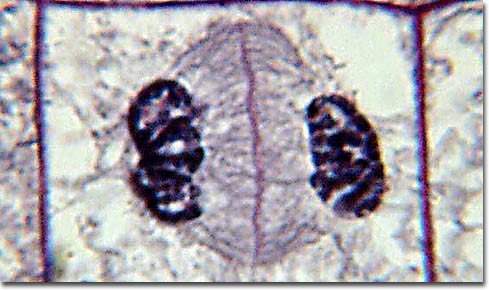 The photomicrograph above shows the positioning of the chromosomes in late anaphase. The polar microtubules are a clearly formed network and the synthesis of a new cell membrane has been initiated in the cytoplasm between the two spindle poles.